We were months late getting our winter forage planted this year. We didn’t have many options because of this, so most winter forage is ryegrass. Most of it is looking good now and very green. We haven’t had too much rain to leach nutrients, and weather has been similar to a normal October/November. We typically put 50 lbs of N at planting, in winter, and again in spring. We will still be able to get in another few fertilizers if need, but probably one less than normal. At this time, we need to check small grains for deficiency and put on another 50 lbs when we see the lower leaves yellowing. Standard soil test recommendations are that one should put out 50 lbs of N/acre on ryegrass and small grains in late winter (late January – February) and another 50 lbs of N/acre on ryegrass in early spring (mid-March – mid-April). Applications of N at these rates are likely to result in more than 15-20 lbs of DM per lb of added N for the late winter application and more than 20-25 lbs of DM per lb of added N. As a general rule of thumb, N response rates greater than 15-20 lbs of DM per lb of added N will result in an economical response. Scenario 1) Ryegrass or small grains that have been slow to grow, either because of bad weather or N deficiency (and, sometimes, a late planting). These winter annual forage crops will often respond very aggressively to a winter application (20-30 lbs of DM per lb of added N assuming N rates are 40 – 60+ lbs of N/acre). It is analogous to compensatory gains in growing livestock. It is the same basic principle: an organism that has had growth limitations will often grow at extraordinary rates whenever those factors are no longer limiting. Scenario 2) Ryegrass or small grain plantings that have been growing strong. 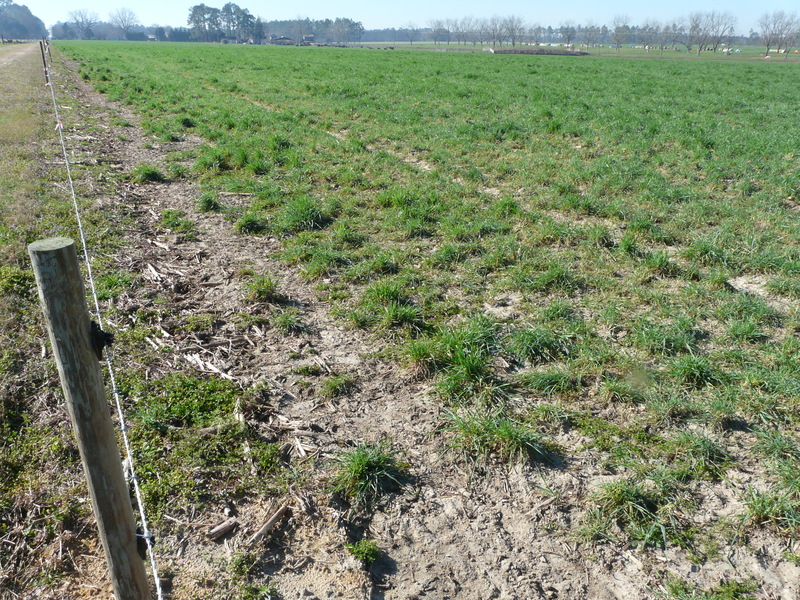 Winter annual forage crops in this scenario are unlikely to respond as aggressively to N at this time. For example, they may barely provide 15 lbs of DM per lb of added N during the few weeks following N application. However, this N is still crucial, as it keeps the plant growing at least at a healthy rate. Therefore, it is important to fertilize them at the same or nearly the same rates because they will need the fertility during the remainder of the season. Scenario 3) Winter annual forages that have been moderate to severely damaged by disease (Helminthsporium leaf spot, grey leaf spot/blast, leaf rust, or barley yellow dwarf virus, etc.). These forage crops are unlikely to respond to N application. 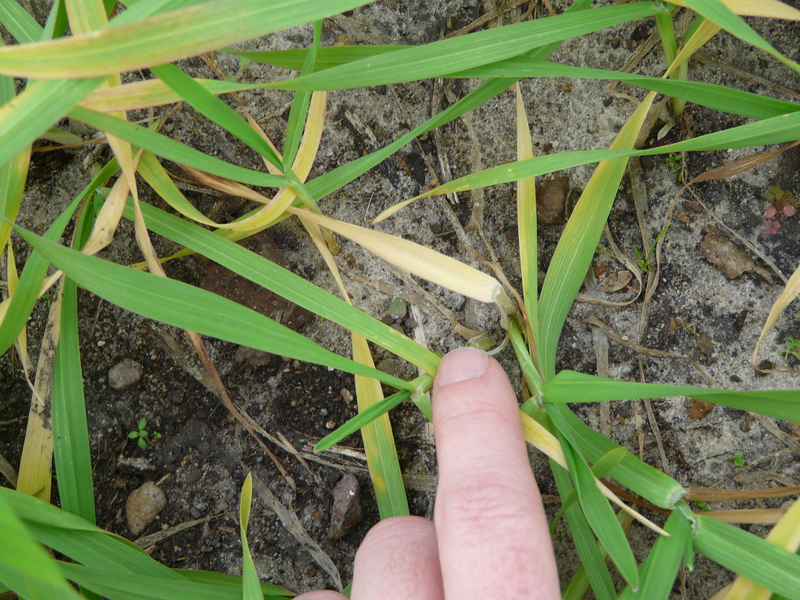 For example, tillers that are exhibiting physical symptoms of barley yellow dwarf (BYD) infection will die quickly, especially following a hard freeze. Therefore, if more than 30% of the tillers in a stand of oats have been damaged by barley yellow dwarf, those plants are unlikely to respond well to N. Each producer will have to determine if they are willing to take the risk, but if it were my oats, I doubt I would put any more N into those areas/fields.